Scientists have produced the most detailed map yet of Antarctica. US and UK researchers have stitched together more than 1,000 views of the White Continent to make a stunning new high-definition polar panorama. The images come primarily from the American Landsat spacecraft and show features on the 3,500km-wide icy terrain down to a resolution of 15m. The international team behind the project says the true-colour mosaic will revolutionise Antarctic research. It is said to be 10 times more detailed than any made before. It can be browsed through a free-to-use website, and the data will also be made available for use on "virtual globe" software, such as Google Earth. "This is how Antarctica really looks and you can have any piece of it you want. This really is Antarctica in true colour," said Robert Bindschadler from the US space agency's (Nasa) Goddard Space Flight Center. "Most people have never been to Antarctica, yet Lima is a way we can bring Antarctica to them." The Landsat Image Mosaic of Antarctica (Lima) is a collaborative effort between Nasa, the US Geological Survey (USGS), the US National Science Foundation (NSF) and the British Antarctic Survey (BAS). The project team has had to search through a multi-year archive of images to find all the cloud-free pictures of Antarctica. 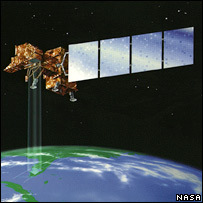 The current Landsat 7 platform provides coverage down to about 83 degrees South. The "hole" in the data below this latitude has been filled with pictures from the Modis sensors on Nasa's Terra and Aqua satellites. For the Landsat 7 pictures, each pixel represents a little over half the length of a tennis court. To cover Antarctica, more than 100 billion such pixels are required. "This is the highest resolution dataset for the entire continent," said Andrew Flemming from BAS. "There are huge areas that people have simply not seen in this detail before," he told BBC News. The new mosaic will provide invaluable support for logistics. It will allow field parties - the glaciologists, the geologists, the biologists and other Antarctic scientists - to recce places before they go in. Some small sections of the mosaic have already been shared with pilots who have wanted a "heads-up" on locations into which they have never flown before. The mosaic's higher resolution will help researchers interpret changes in land elevation in hard-to-access regions. Scientists also think the true-colour mosaic will help them better map various rock formations and types. "Yes, it's stunning to look at - but it's not just a pretty picture," said Andrew Flemming. "Taking over 1,000 satellite pictures and turning them into a near-seamless image of the entire continent is no trivial task. This is a real, calibrated, rigorously processed surface-reflectance dataset; so the values actually mean something and scientists will be able to compare values from one side of the continent with the other." Lima is released in the middle of what is International Polar Year (IPY) - the global science community's concerted push to try to answer the big questions about the Earth's northern and southern extremes. Parts of Antarctica, in particular on the Peninsula, are among the fastest warming places on the planet. Some ice shelves and glaciers are undergoing dramatic change. The current mosaic will provide a snapshot of the continent that can be compared with future datasets to detail those changes.